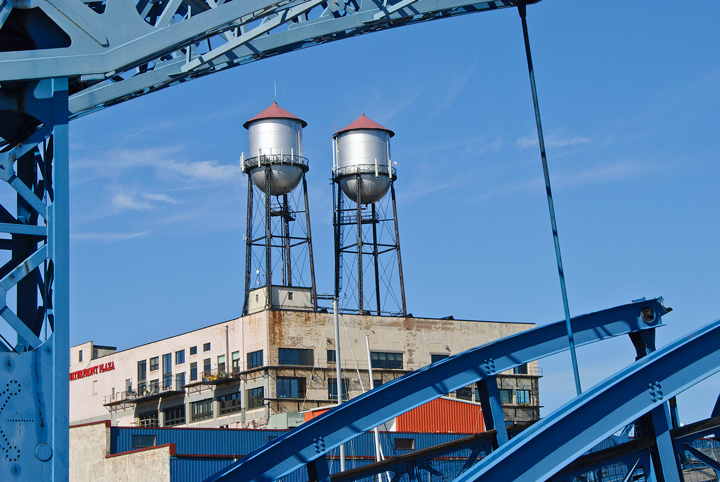 Last Thursday we decided to take a walk around Downtown Duluth, Minnesota. It had been a while since our last visit and we wanted to see what was going on. 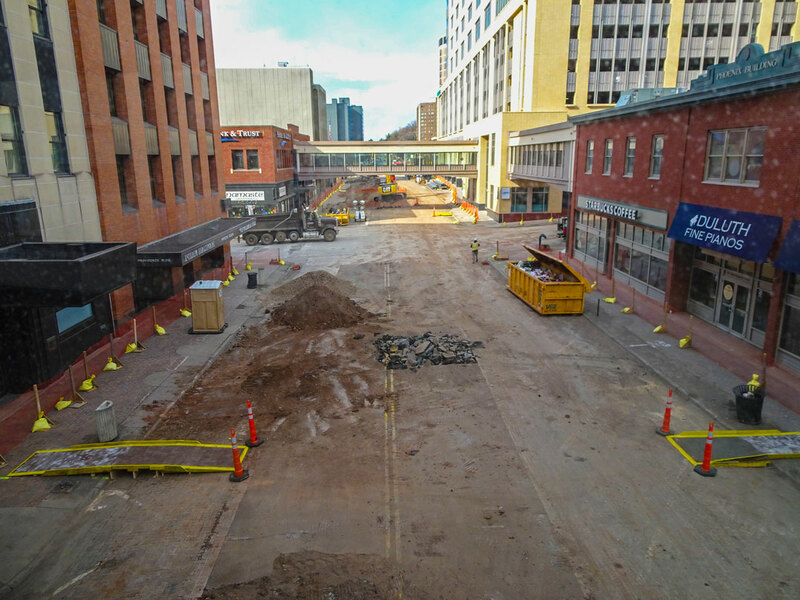 Our first stop was to check out the Superior Street Construction. 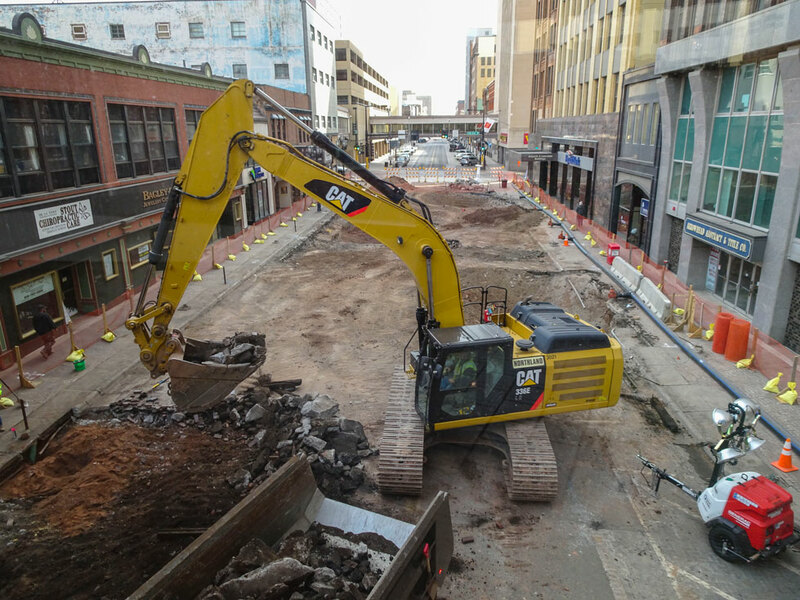 Duluth has decided it was time to replace Superior Street and update the utilities under the street. This is phase one of a three year project. 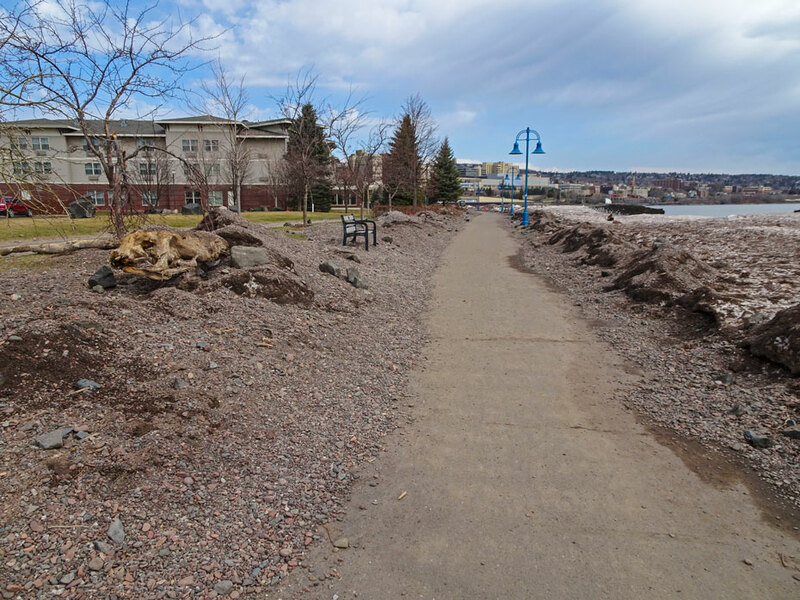 Unfortunately in redesigning Superior Street the Duluth City Council had it’s head buried in the sand. Rather than rebuilding the street for the future they decided to build for the past. After all parking was the top priority of the businesses along the street even though there was plenty of unused parking in adjacent ramps. Having traveled extensively I was aware that the future of downtown’s is in walking streets and both in this country and Europe are many good examples of walking streets. Reykjavik, Iceland turns their main streets into walking streets during the summer months. Well Duluth is not know to be a forward looking community. We then attempted to walk down to the harbor area through the sky walk. Unfortunately access to the harbor was blocked off. 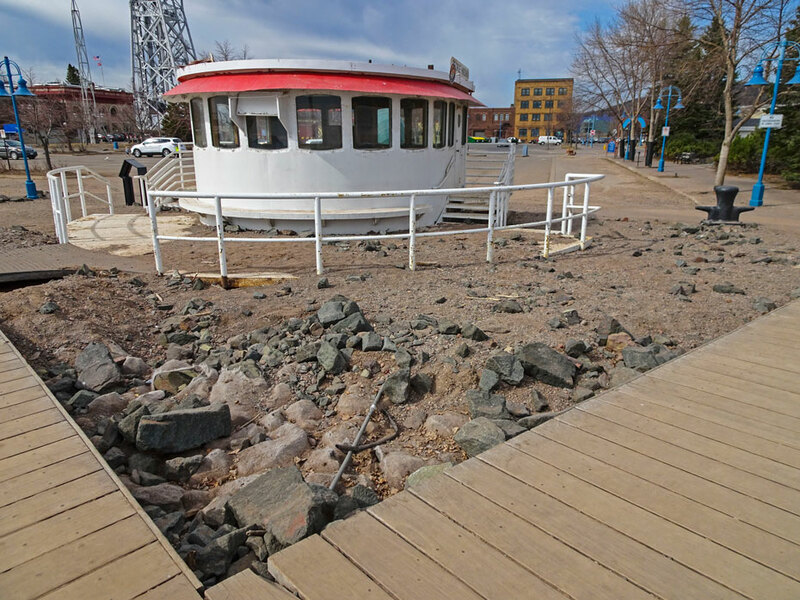 A severe spring storm damaged the waterfront a few weeks ago. There were already problems along the harbor as the seawall had been undercut and the land was falling into the harbor. The storm made matters worse. 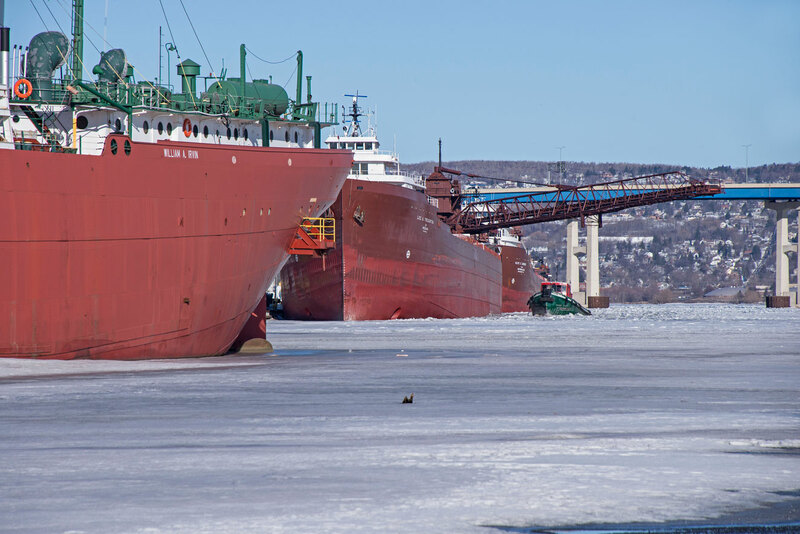 This happens to be the area where the Tall Ships dock when they come to Duluth. Probably no Tall Ships until the area is repaired. There were workmen in the area attempting to assess the damage. 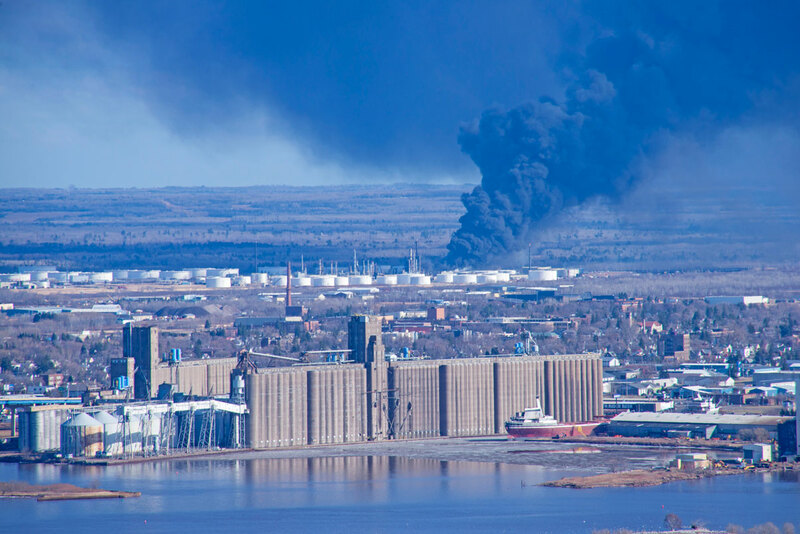 While we were checking out the damage we noticed some unusual smoke coming from the Husky Energy oil refinery in Superior, Wisconsin. We figured there had been a minor accident and didn’t pay much attention. 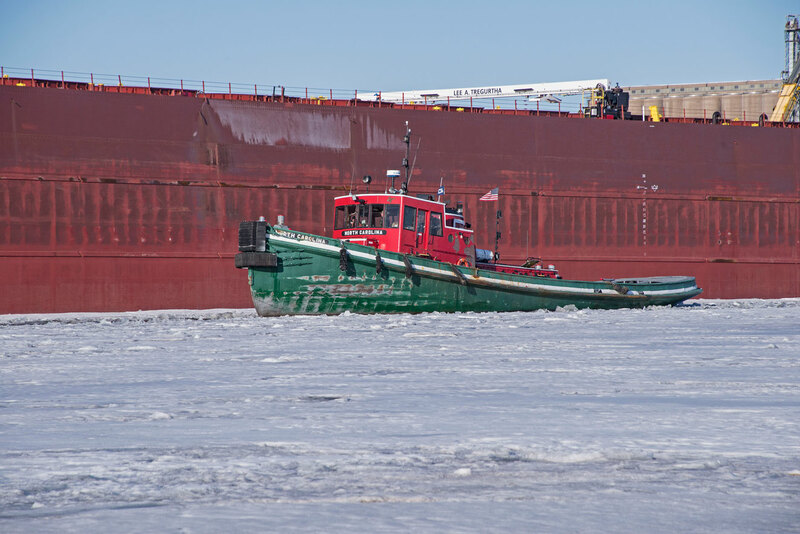 We then had to take a circuitous route to The William A. Irvin because the harbor area is blocked off. This is an old ore ship that has been turned into a museum and offers tours during the summer. This area was already under repair because pier had been undercut by wave action. 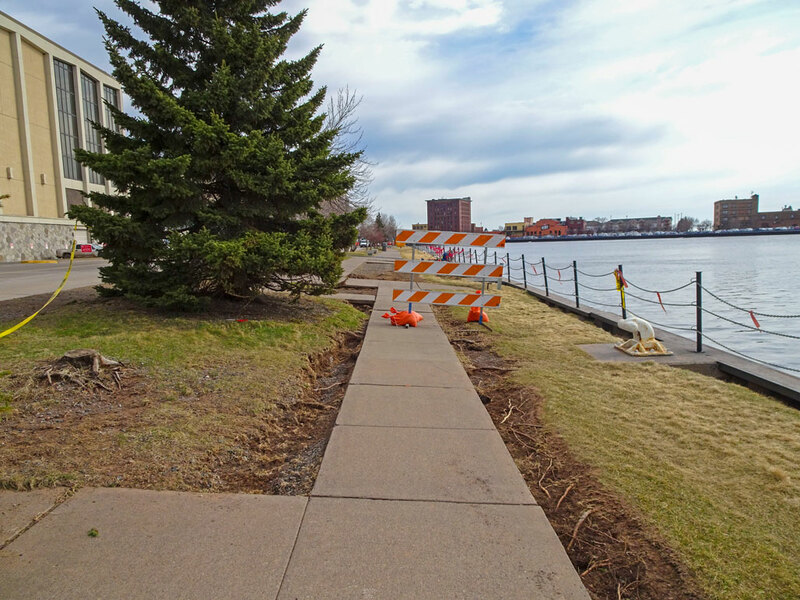 The $6.1 million Minnesota Slip seawall reconstruction project just resumed after a lengthy delay. Unfortunately the project failed to get the proper signatures and was closed down for six weeks. 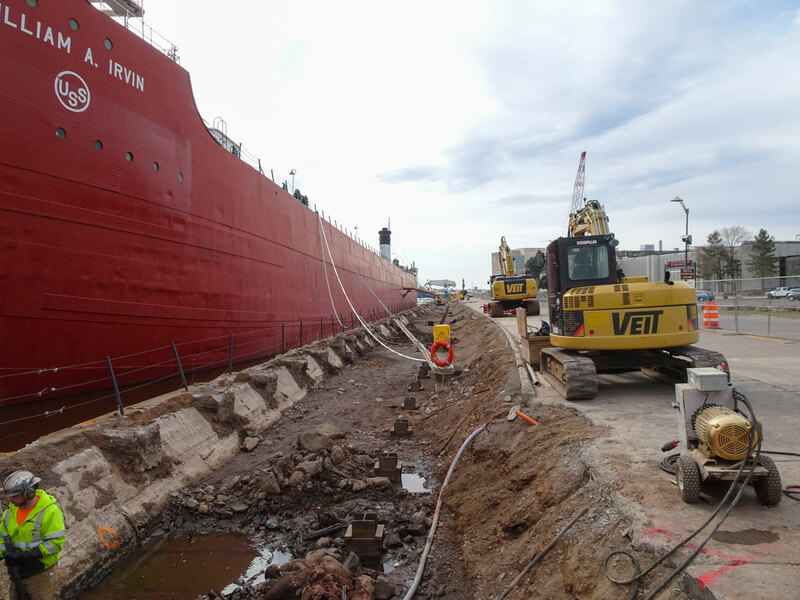 The plan is to drive new steel pilings then pour a new seawall. The delay has caused problems for the Vista Fleet tour boats one of which docks in back of the Irvin. If that wern’t enough the slip is contaminated and remediation is scheduled to take place this fall. 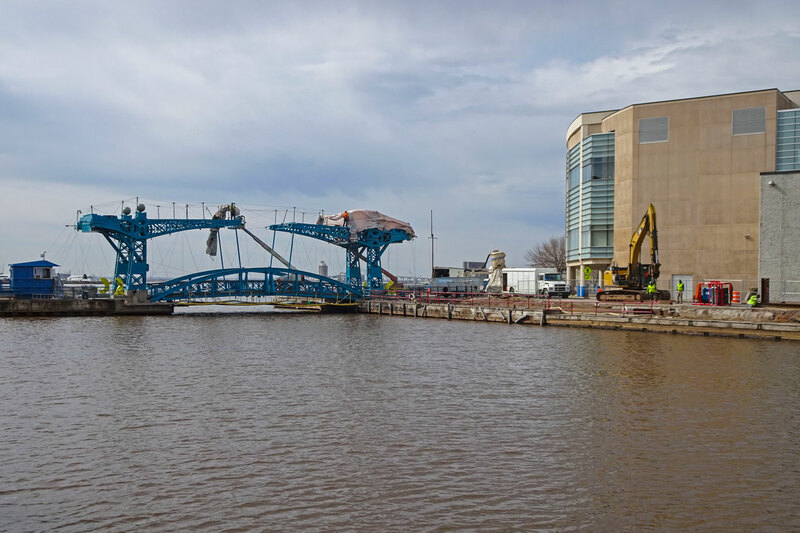 In addition the Blue Slip Bridge was undergoing painting and it was also closed. This section of the seawall was breached in the April storm. 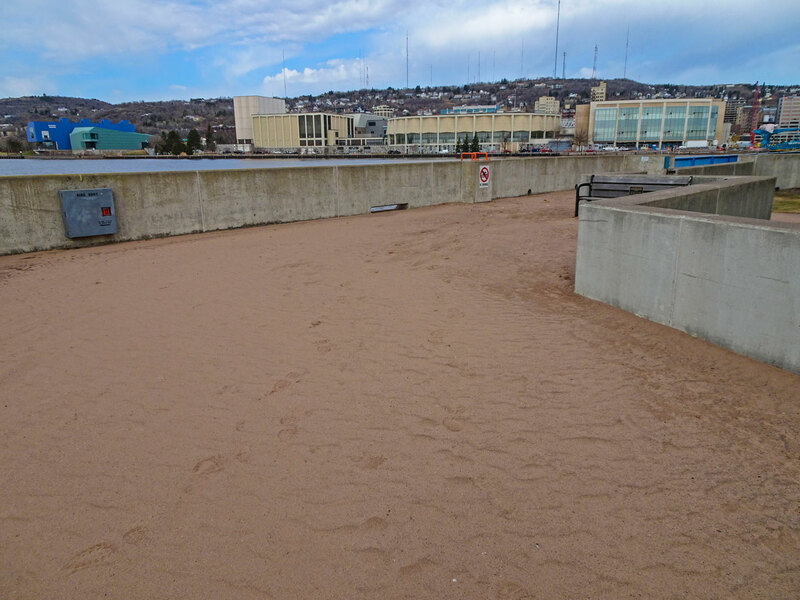 Waves were above the seawall and sand still has not been removed. 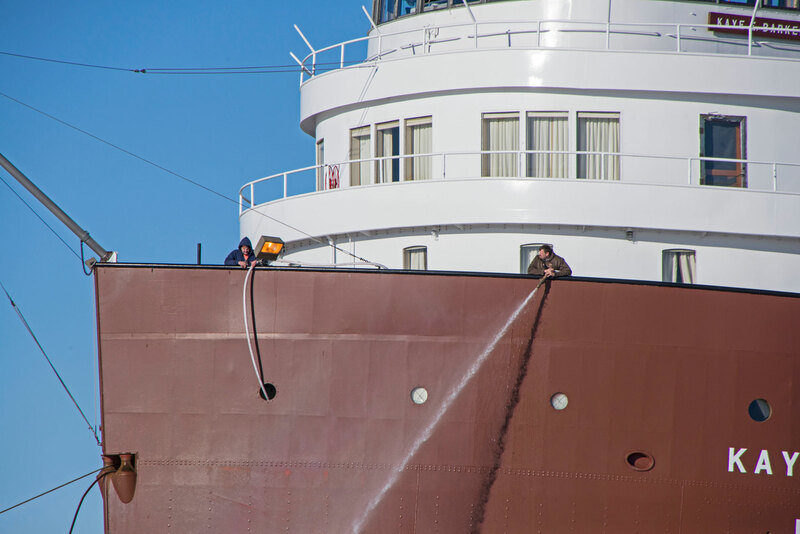 The waves were so high they touched the bottom of the Aerial Lift Bridge. Canal Park remains a disaster zone. A sever October storm severely damaged the lakewalk. The April storm did even more damage. The pilot house used for the bike rentals is closed and will likely not open this summer and perhaps it will never reopen. Because of the damage to the lakewalk the city decided the rental bikes take up too much space in the remaining walk area. 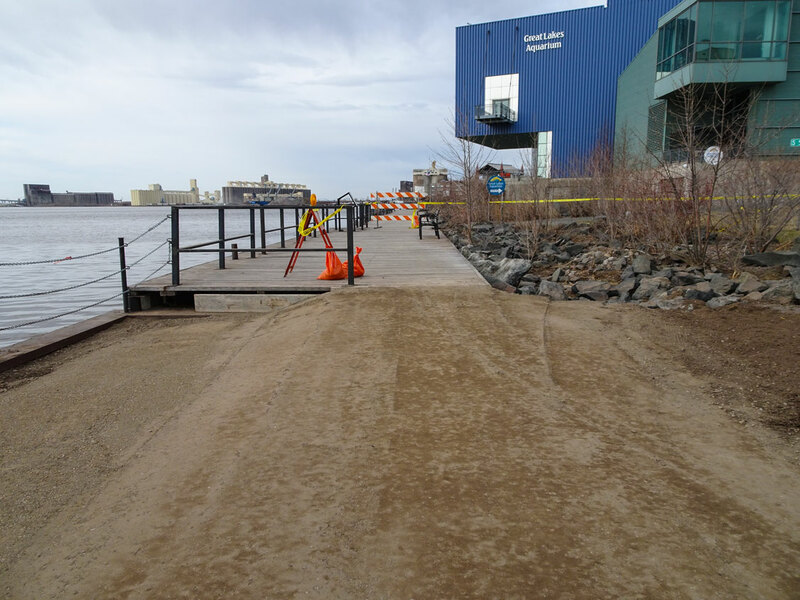 The bike path will have to be used for walkers and bikes because the boardwalk was destroyed in the October storm and experienced even more damage in the April storm. 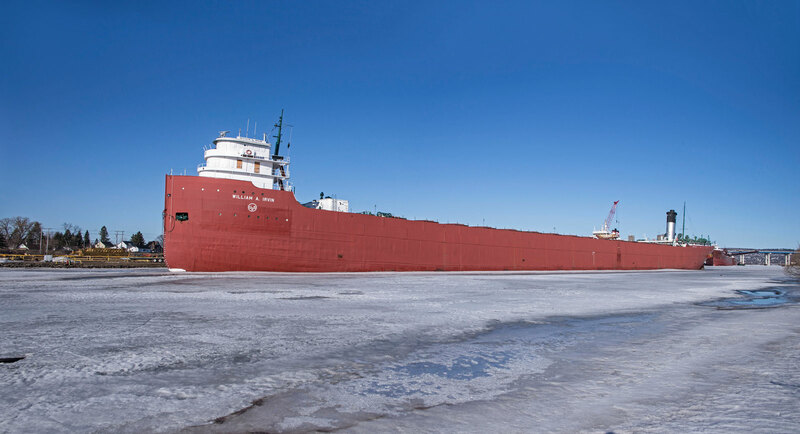 Current estimates are that it will take two years to repair the damage. 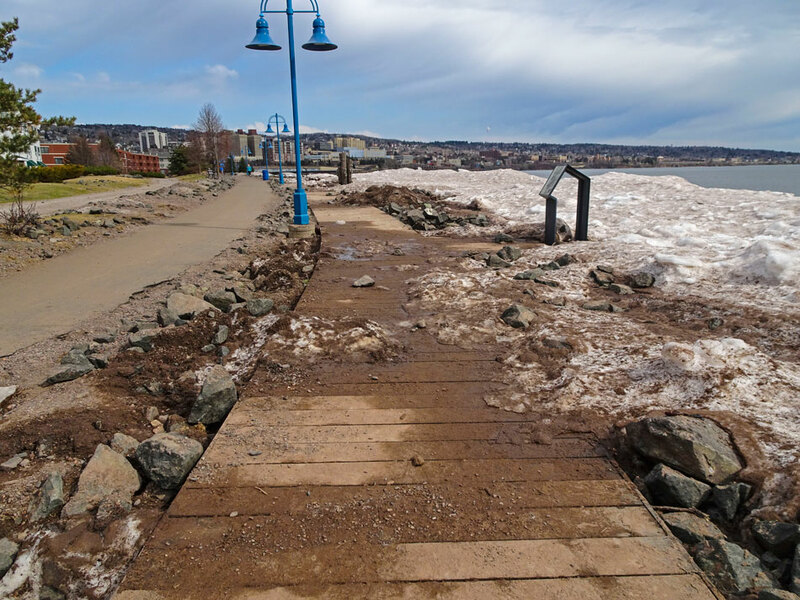 The city has not been able to assess the damage from the most recent storm because the boardwalk and surrounding area is still covered in ice from the latest storm. 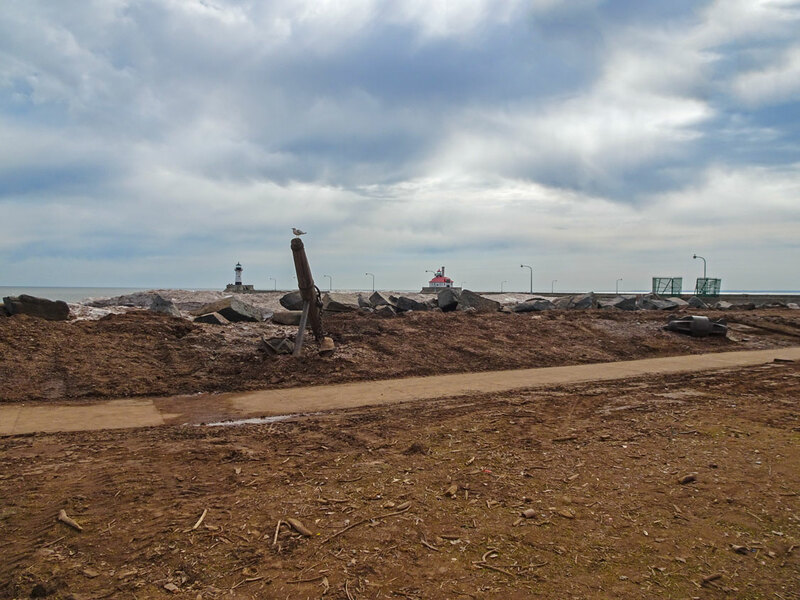 After lunch we decided to take a walk over to Park Point to assess the damage to the beach area. 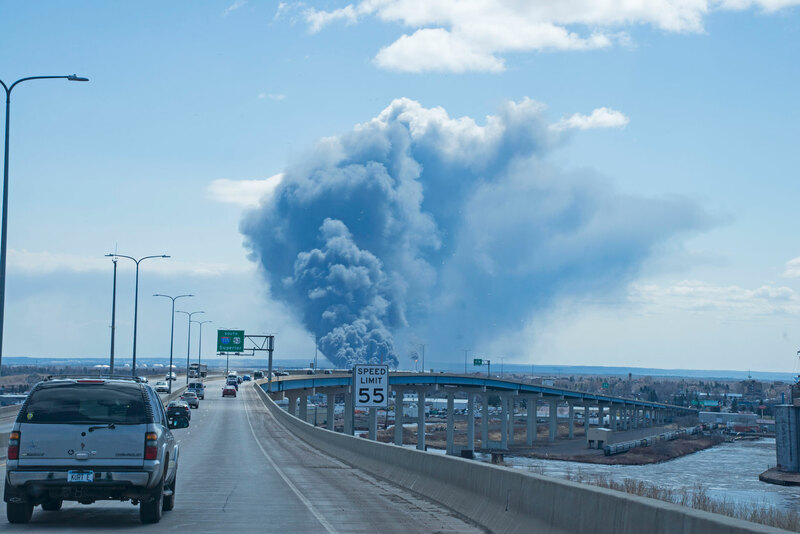 As we started our walk we could see huge plums of smoke coming from the Husky Energy oil refinery in Superior. We decided that we had to drive over that way to get some meat at Superior Meats so we should check out what was going on at the same time. As it turns out there was a minor explosion which is what we saw in the morning but around noon there was a major explosion and fire. Fortunately no one was killed and only one person was seriously injured. Most of the workers were having lunch in blast shelters at the time of the explosion. This shot is from the Blatnick Bridge. 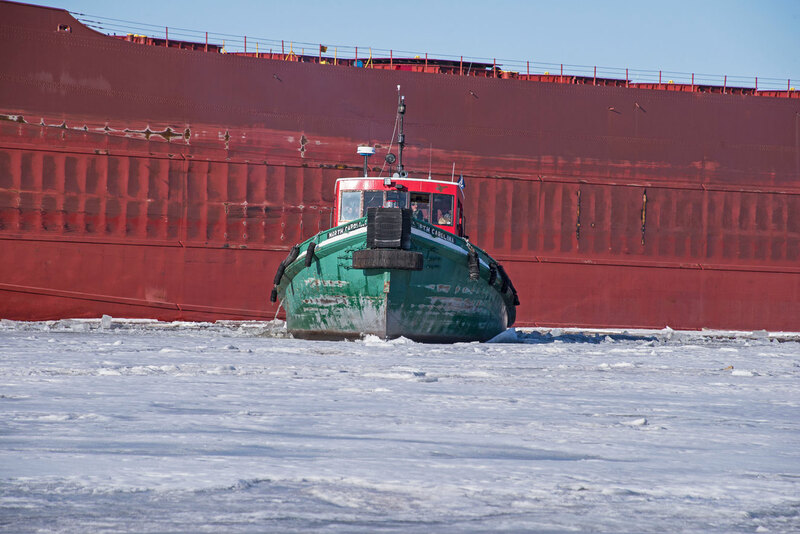 A second shot from Superior. 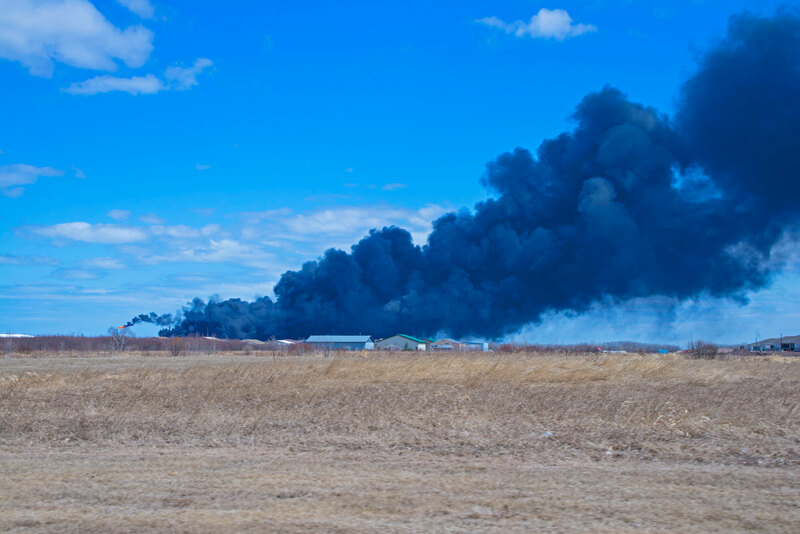 A shot taken near the Superior Airport which is near the refinery. As were driving toward Superior Meats my wife complained about all of the traffic. She though there might be an evacuation of the area. I thought she was nuts it was just a busy time of day. When we reached Superior Meats the door was locked but there was no notice on the door. About that time my wife received a mandatory evacuation order on her phone. The all of the employees came running out of the store. We decided that maybe we shouldn’t be driving around through a toxic cloud. Later in the day we drove up to Enger Park to check out the fire in Superior. 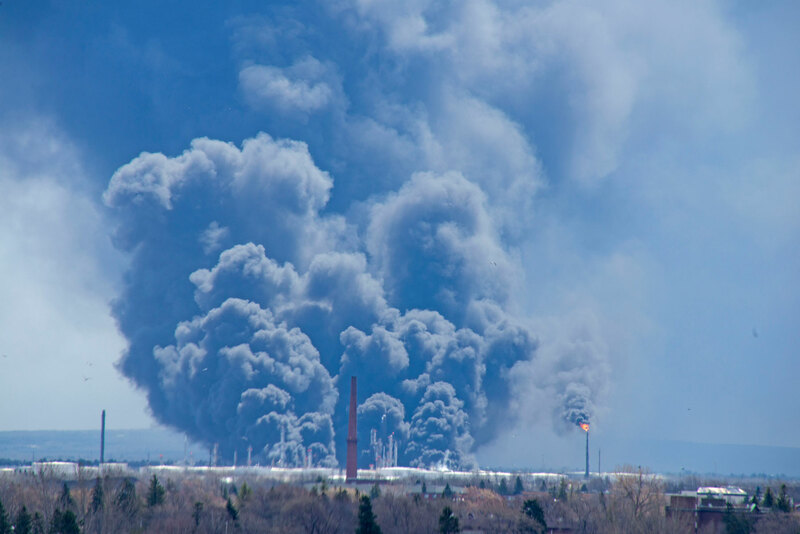 It was getting late in the day and the fire was still spewing a toxic cloud of smoke. There were a number of people watching the fire. Apparently some of them had been evacuated from Superior because the kids wanted to know when they could go back home. After that excitement we drove down to Park Point. 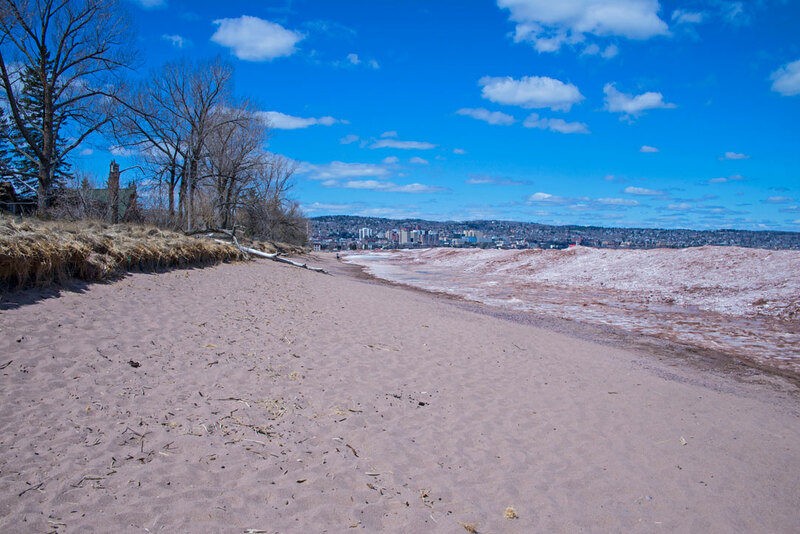 We love to walk the Park Point beach but between the eroded shoreline on one side and the high ice wall on the other there wasn’t much to see so it was a short visit. It doesn’t appear that this storm cause much more damage along the shoreline. The October storm caused considerable damage. That along with the the high lake levels in Lake Superior had caused flooding in the basements of many Park Point homes. They have been running sump pumps to keep water out of their basements. 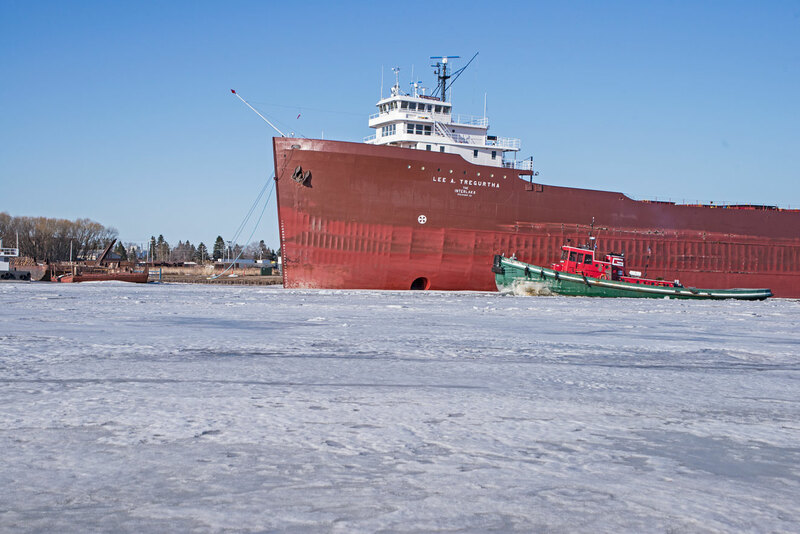 What started out as a nice walk through Duluth turned in to a disaster tour of the Twin Ports. 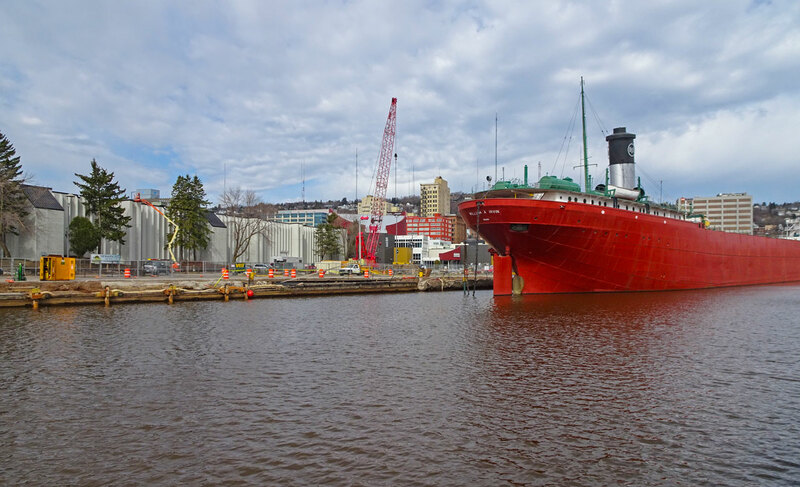 There is always activity around Duluth’s Water Front Plaza Marina in Canal Park. A small pedestrian lift bridge allows pedestrians to cross the water over the entrance into the Marina. 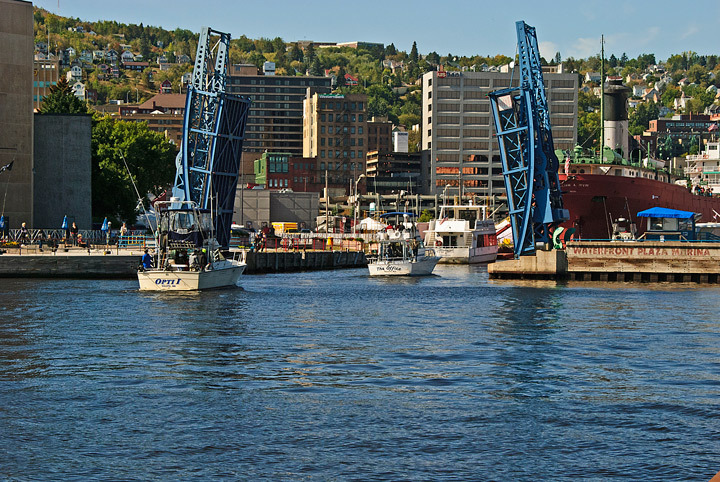 As we approached the Marina the lift bridge was up to allow several sport fishing boats to enter the Marina. There are boat slips along both sides of the marina. This photo shows the boat slips used by sail boats and commercial sport fishing boats. We walked across the bridge to the plaza next to the Vista Fleet boat docks. 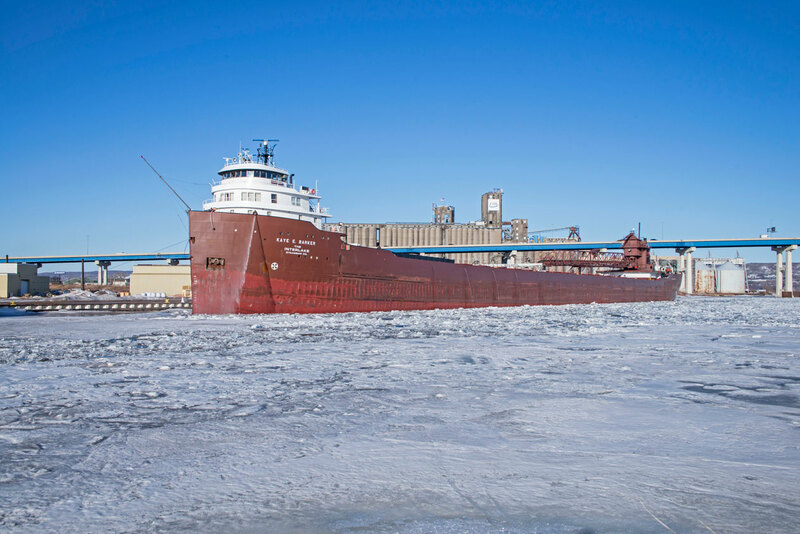 I was watching a sail boat come toward the lift bridge but it was going very slowly. When I looked back to the lift bridge I noticed there was a wedding party on the bridge having their picture taken. When the bridge operator announced the bridge was going up the wedding party scattered in all directions. This is a shot of the bridge as it was coming down. 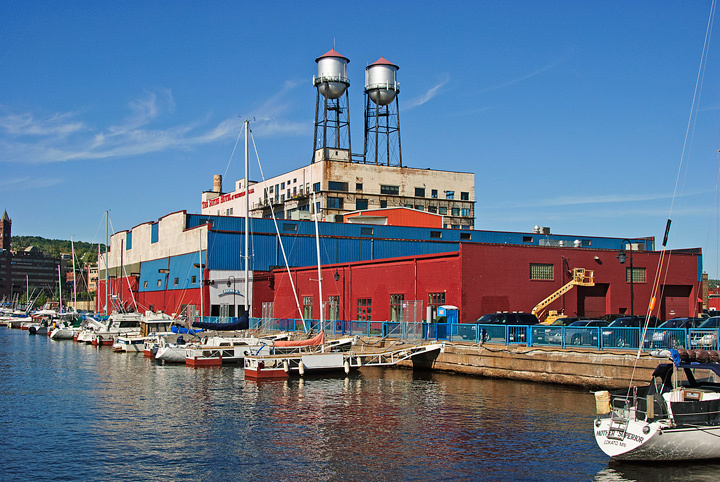 While one side of the Marina has slips for commercial fishing boats the other side of the Marina houses the William A. Irvin and the Vista Fleet boats. 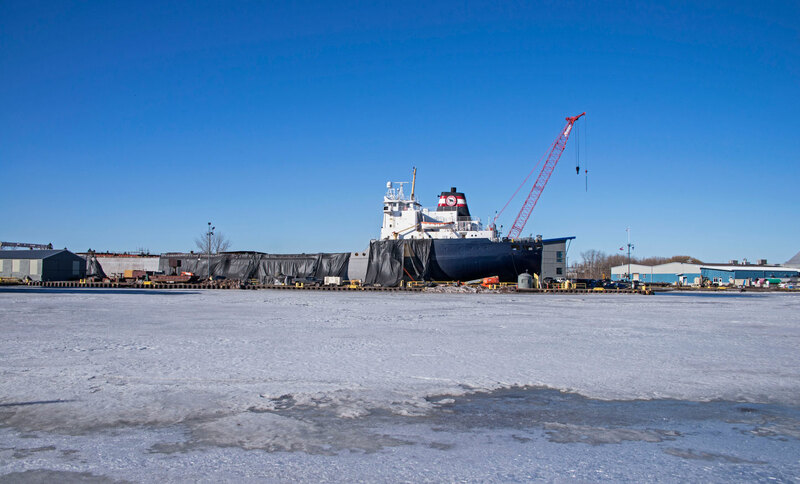 The Irvin was the flagship if U.S. Steel’s Great Lakes Fleet and is now permanently moored at the dock. The Irvin is open to the public and is a great tour to take the kids on. Around Halloween it becomes a haunted ship. 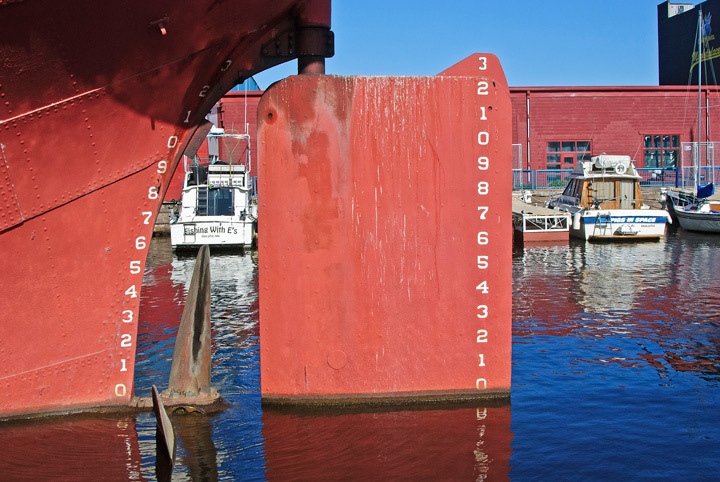 this is a close-up of the rudder of the William A Irvin.